Savoy cabbage is a great way to hydrated your skin because it’s full of vitamins which are beneficial for the skin, nails and hair. For example, vitamin K from savoy cabbage can be used for dark circles under your eyes, wrinkles and scars, omega-3 acids for scalp moisture, hair growth and dandruff removal. You could combine savoy cabbage leaves with body lotion and use it for dry skin, or with olive oil to make moisturizing mask. Because of its great skin great healing properties, savoy cabbage can be used topically as a treatment for various skin eruptions like psoriasis, insect bites, acne, wounds and eczema. Savoy cabbage is a rich source of vitamin A, an antioxidant that stimulates hair growth. You can use it topically twice a week to get the best results. 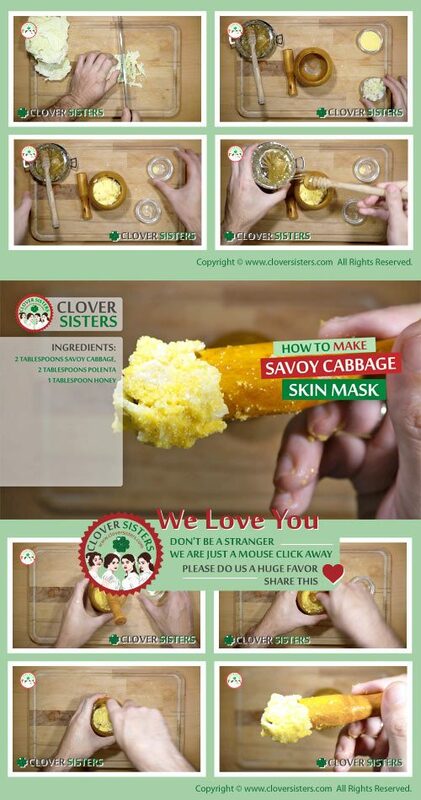 Easy to made skin mask, natural and available at almost no cost at all. Steam savoy cabbage, in 2 cups amount after steaming. Blend it and mix with 2 tablespoons of polenta and 1 tablespoon of honey. Use it regularly to improve skin elasticity and general quality.